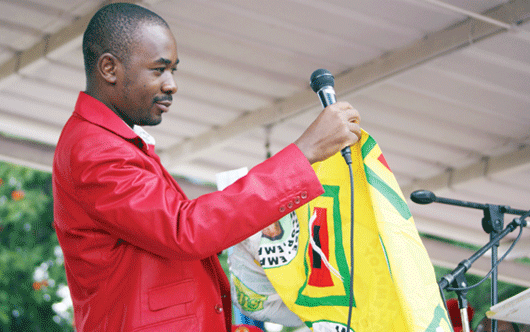 A GROUP of war veterans opposed to Zanu PF rule has given thumbs up to opposition MDC Alliance presidential candidate, Nelson Chamisa's pledge to improve the welfare of former combatants, saying the youthful opposition leader had politically matured and risen above partisan politics. The Non-Partisan Freedom Fighters (NPFF) in a communiqué last week, castigated their colleagues in the Zimbabwe National Liberation War Veterans Association (ZNLWVA), particularly spokesperson Douglas Mahiya for exhibiting partisan political conduct and failing to address former combatants' concerns. "As freedom fighters, we categorically dissociate ourselves from utterances of the ZNLWVA spokesperson Douglas Mahiya who in the course of a recent political debate, admonished presidential aspirant Nelson Chamisa for allegedly meddling with issues concerning the welfare of war veterans, when it is common knowledge that those issues were patently and pertinently matters within the realm of public policy," part of the communiqué read. The NPFF is made up of former Zipra and Zanla top commanders who include Happyson Nenhi, whose liberation war name was Webster Gwauya, Bernard Manyadza (alias Parker Chipoyera), Ngoni Chitauro, Cyprus Tshuma and Thomas Ndlovu, among others. Chamisa last month promised to address the welfare of the former freedom fighters if he is voted into power in the July 30 elections but immediately drew the wrath of the Zanu PF-aligned ZNLWVA that has openly declared its allegiance to President Emmerson Mnangagwa. Mahiya accused Chamisa of seeking political relevance by meddling in war veterans' issues. The NPFF castigated the stance taken by some top Zanu PF officials that they would not recognise a victory by an opposition presidential candidate. "The re-incarnation of these ill-conceived and frivolous political machinations which are manifest in statements made by prominent members of the ruling elite, deputy Finance minister Terrence Mukupe, Masvingo Provincial Affairs minister Josaya Hungwe and Zanu PF commissar Engelbert Rugeje, insinuating military intervention by armed forces on behalf of the ruling party are cause for concern and should be condemned in strongest terms "The averments that remind the nation about the regrettable comments attributed to the late General Vitalis Zvinavashe that implied the Office of the President in Zimbabwe was a preserve for those with liberation war credentials - the strait jacket mantra - are not only mischievous but should be viewed as unconstitutional and prosecutable," the war veterans said. The war combatants urged the military to respect the Constitution and refuse to be dragged into Zanu PF partisan politics.